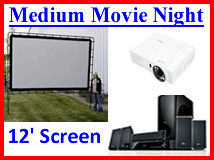 12 Foot screen combined with our HD projectors, DVD/BluRay player and our 1000 watt sound system. Please note: For best results, start the movie when the sun goes down. Cannot set up outdoors if there is a chance of rain, or if its windy. Recommended for crowds of up to 50 people indoor or 25 people outdoor. If your expecting more, please call us so we can discuss better options to reinforce the sound or screen size.